You give me ground meat, and being the simple home cook that I am I go straight to meatloaf, meatballs, or sloppy Joe’s. ARGH! So, in my feeble attempt to think “outside of the box,” I decided to make a fritter. Okay, okay, so I can still see the box sitting on the bar stool next to me but I’m outside of it...a little! Testing this recipe was fun and super filling. My sister, who has decided that all carbs are sinful and that she will NOT partake of anything with flour or corn in the ingredients list, stopped by my house when I was in the throes of testing my recipe. She tried one of my little Mexi-Fritters because “they don’t have THAT much flour or corn in them.” Half an hour later, she and my husband were asking for another batch. Rules are meant to be broken. Heat the olive oil in a skillet or Dutch oven over medium high heat. Add the onions and cook until tender, about two to three minutes. Add the garlic and the Cluck 'n Moo Ground. Brown the meat, breaking up the pieces into smaller chucks as you cook. Continue cooking about 5 to 7 minutes, until the meat is cooked fully through. Add 1/4 teaspoon cayenne pepper, the ground coriander, the oregano, 1 Tablespoon of the ground cumin, the chili powder, 1 teaspoon of the salt, the red pepper flakes, the 1/2 can of petite diced tomatoes, and the Tabasco sauce. Cook an additional 5 minutes. Remove from heat and allow to cool completely. Using a food processor, put half of the meat mixture into the food process and pulse 5 to 10 times until the meat is ground fine. Add it back to the skillet or Dutch oven and combine the ground meat with the chunky meat. Tablespoon of the dough into a sticky ball and placed them onto a floured plate. Cooking a dozen at a time, I cooked the fritters for three minutes, turning them with a slotted spoon to make sure they browned evenly on all sides. After three minutes I drained them on a wire rack, salted them, and served. If you decide to cook them in a skillet, just put enough oil in the bottom of the skillet to come about half way up the side of the fritters. Heat the oil before adding the fritters. Again, cook the fritters for about 3 to 4 minutes, turning half way through. Then drain on a wire rack or paper towels. Remember, the meat is already fully cooked! 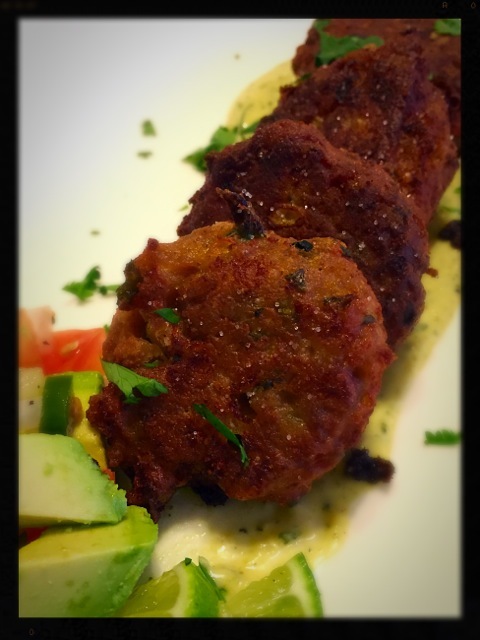 These are delicious as a little appetizer popper or served inside a soft flour tortilla (sort of like a falafel.) Play with it. I made a spicy jalapeño aioli to go with it. Note that you’re going to get at least two dozen fritters out of this recipe, depending on the size of dough ball you make. If you have more than you need, just measure the fritters out onto a lined baking sheet and freeze them. Once frozen, drop the individually frozen fritters into a zip top bag and put them back in the freezer. If you want to cook a dozen fritters, just pull a dozen out of the bag, thaw them completely, and cook just as described above. My husband and I spent four years stationed at Katterbach Kaserne in Ansbach, Germany, where he grew up for part of his childhood and where his mother and grandmother are from. We had four absolutely amazing years filled with family, friends, food and travel experiences that we’ll never forget. The Ansbacher Burger is my take on the simple elements of German fare and a little tribute to two very special ladies and outstanding cooks, Mutti-Oma Ingeborg Jahn and Ingrid Wenninger. I hope you enjoy the Cluck 'n Moo Ground product as much as we did. Not only is their product healthy and delicious, but they are an upstanding company that is cruelty free and hormone free. Check out their FAQ's for the many other reasons to support this great company. Liberal pinch of Salt (I used Profumo Del Chianti™, an aromatic fine grind sea salt with herbs.) Any specialty salt will give a nice subtle flavor: Pink Himalayan, Smoked Alderwood, or any salt of your choice will work. Begin by using a medium mixing bowl. Add Cluck 'n Moo Ground, parsley, garlic, onion powder, egg, olive oil, salt and pepper. Mix well with hands and form into 5 patties. Heat grill. When ready, place burgers on grill with lid closed. Cook on first side until juices have formed and burger easily lift from grill, then turn over and add 2 slices Swiss cheese. Cook to an internal temperature of 165°F and remove quickly. DO NOT press burger at any time while cooking. Cut pretzel rolls in half. Set up burger by adding a liberal swipe of mayonnaise to each side of your pretzel roll, then place your burger on the bottom half of roll. 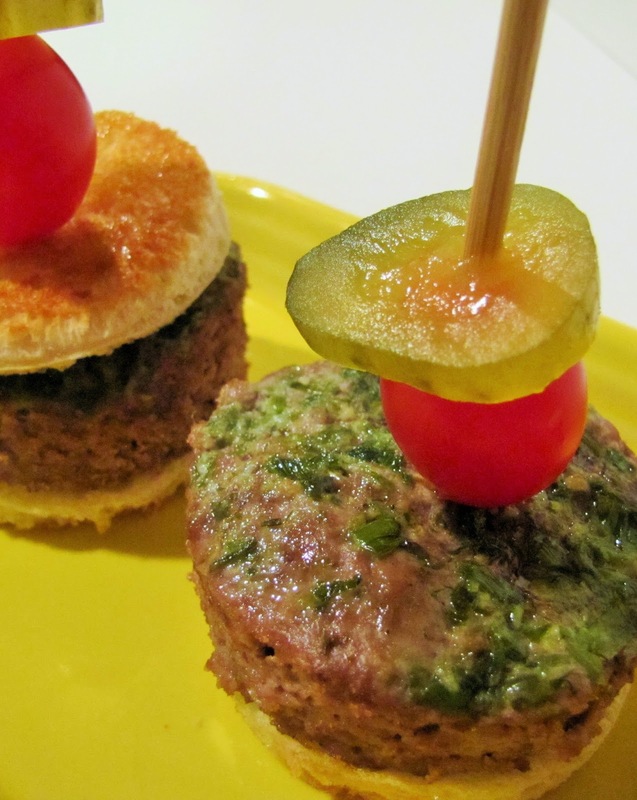 Add a swirl of mustard and some sauerkraut, and finish by placing the top on your burger. This meal pairs nicely with a side of Hot German Potato Salad and a Hefeweizen. I love layers to my food. Layers in texture and layers in flavor. This recipe is all about layers created by multiple flavors and textures. It begins with a hearty center of beautifully blended chicken and beef laced with jalapeno and cumin. Then a smoky kick of chili sauce dances on top before it's wrapped in a moist corn jacket that has been studded with fresh corn kernels. If that wasn’t enough to create a party on your taste buds, there is a dollop of Texas-style pecan and cilantro pesto on top. It truly is a journey to tamale heaven and I double dare you to drizzle some sour cream on top and a splash of your favorite salsa. Combine all the ingredients in a mixing bowl, and using an electric mixer, process until well-blended. The consistency should resemble wet mud. To test the masa, drop a spoonful into a glass of cold water. If it floats you have the right amount shortening, if it sinks, add more shortening, one tablespoon at a time, mixing after each addition. Add all ingredients together in a large mixing bowl and mix well. Cover and refrigerate. Remove tops of dried chilies and shake out seeds. Place chilies in stock pot and cover them with water. Add the cumin, sliced onion and garlic. Boil the chilies until soft, about 20 minutes. Using tongs, transfer the chilies to a food processor along with a ladle full of the chili water. Puree the chilies until smooth. Pass the puree through a strainer to remove any remaining seeds and skins. Pour the chili sauce into a bowl and add salt to taste. This is a spin on traditional pesto, Texas style. Pine nuts and basil have been replaced with Texas pecans and cilantro. Combine the pecans, garlic, cilantro, cheese, jalapenos and 1/4 cup of the olive oil in a food processor. Pulse until pecans are coarse chopped. While the machine is running slowly add the remaining oil until it is completely incorporated. Season with salt and refrigerate until use. Soak the corn husks in hot water until soft and pliable, about 1 to 2 hours. Place 2 corn husks end to end on your work surface with a 2-inch overlap in the center. Keep a bowl of ice water near your work surface, dip your fingers in it and then take 2 Tablespoons of the mesa mixture and place in the center of the husks. Spread the mesa to about 2 inches of the husks edges. Next add about 3 Tablespoons Cluck 'n Moo filling in the center of the mesa. Drizzle about 1/2 Tablespoon of chili sauce on the filling. Tightly roll up the husks lengthwise and tie the ends with strips of the softened husks. I like to soak extra corn husks and tear into 1/8-inch strips and use them to tie the ends of the tamales. Remove from the pot and serve by splitting open the tamale lengthwise and adding a dollop of pecan mash. When I think of Asian food and the flavors that I love to cook with, a burger isn’t the first thing that comes to mind. 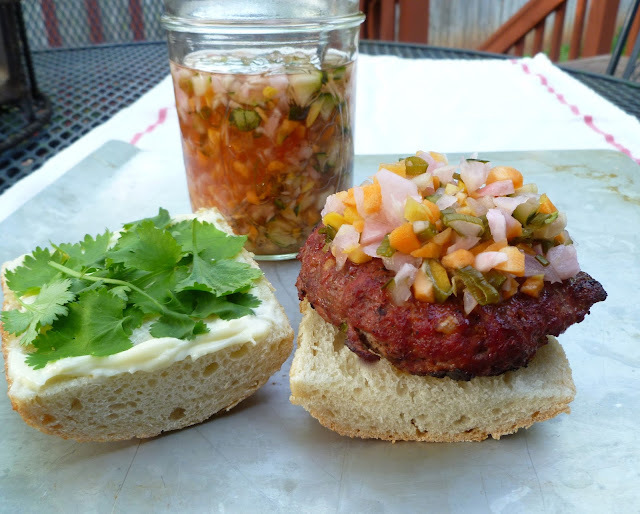 I have made burgers in the past that are flavored with Sriracha Sauce and everyone loved them. 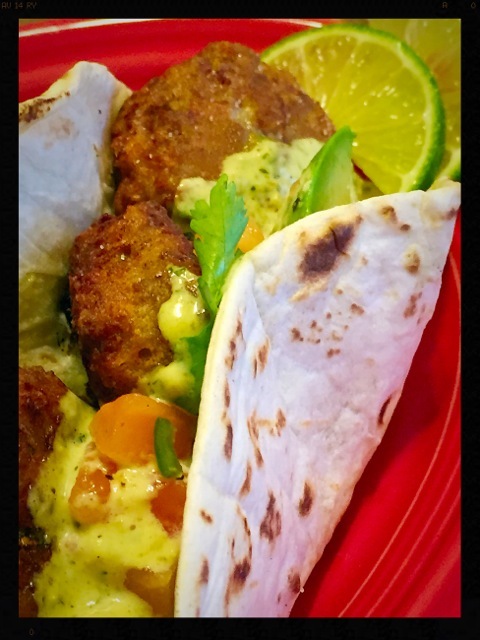 I decided to take these a step further by adding in one of my favorite herbs to cook with, cilantro, then topping them with a creamy sliced avocado and for a little crunch, a nice refreshing simple carrot salad. The final product…delicious! You won’t even know that these are gluten-free and dairy-free. For the burger, I used a combination of beef and chicken which comes pre-ground together from a company called Cluck 'n Moo, who specialize in chicken and beef. The combination of chicken and grass-fed beef boasts 52% less fat and 34% fewer calories than traditional grain-fed beef burgers. Unlike traditional beef burgers, these need to be cooked to a minimal internal temperature of 165°F, because they contain chicken. In a large bowl, combine Cluck ‘n Moo Ground with salt, pepper, Sriracha Sauce, 1 1/2 Tablespoons chopped cilantro and green onions. Mix to combine well. In a medium bowl, combine sugar and hot water, mix until sugar has dissolved. Add in rice vinegar, lime juice, lime zest* and remaining cilantro, mix well. Add in shredded carrots and toss to combine. Cover and refrigerate until burgers are ready to be assembled. Evenly divide into four burgers and shape burgers to fit on the buns. Place burgers on the grill and cook for 4-5 minutes per side, until internal temperature reaches 165°F. Toast buns, if desired. Assemble burger by placing the burger on the bottom bun, adding 1/4 avocado, sliced and then topping with some chilled carrot salad. If you want even more flavor, add some Srirarcha mayo to the bun! Simply take 3 Tablespoons of your favorite mayo (I prefer the vegan mayo) and 1 Tablespoon of Srirarcha. 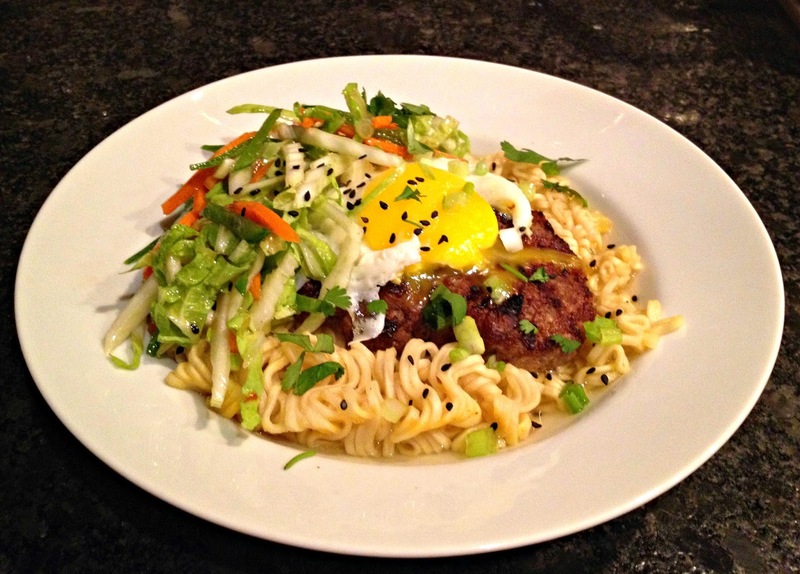 What better way to top off a bowl of comforting ramen noodles than with a tasty meat patty? And let’s just really take it over the top by adding a rich, gooey fried egg! The unique Cluck ‘n Moo blend of lean ground beef and ground chicken was the perfect choice to mix with tasty shiitake mushrooms and hints of oyster sauce and sesame oil. Water chestnuts add nice crunch to this delicious, grilled burger. The spicy slaw adds a bracing, yet refreshing, note to this bowl o’ goodness. Make dressing by placing two tablespoons peanut oil, ginger, and garlic in a saucepan. 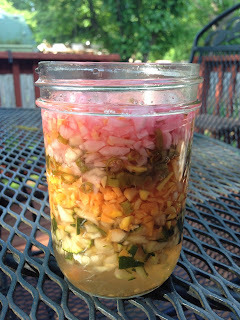 Heat on low/medium-low, gently infusing oil with ginger and garlic. Ginger and garlic should just sizzle, but not cook or burn. After ginger and garlic start to brown (about 2-3 minutes), remove and discard. Remove pan from heat. Cool slightly, and carefully stir in brown sugar, mirin, soy sauce, sesame oil, and sambal. Whisk in remaining peanut oil, vinegar, and season to taste with salt and white pepper. Chill for one hour. In a large bowl, combine cabbage, carrots, snow peas, green onions and cilantro. Toss with dressing and chill, covered, in refrigerator until ready to serve. In a large bowl, combine Cluck ‘n Moo meat, water chestnuts, mushrooms, oyster sauce, sesame oil, salt and pepper. Form mixture into four patties. Grill patties on outdoor grill or indoor pan for four minutes per side, or until internal temperature reaches 165°F. Remove from heat and keep warm. Prepare ramen according to package directions; divide evenly among four shallow soup dishes. In a skillet, fry eggs in oil to desired doneness. 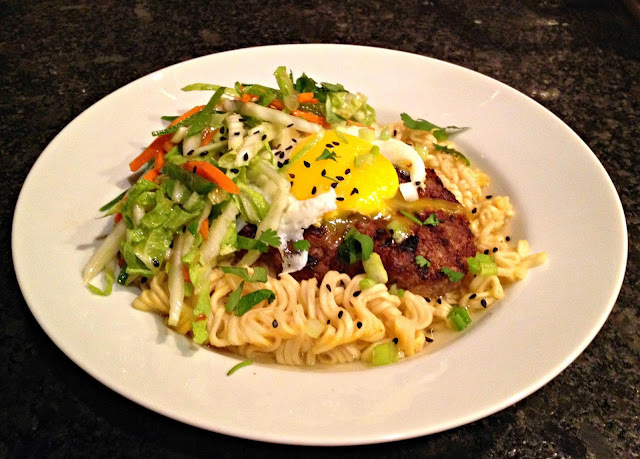 To assemble: Place a burger patty on top of each dish of noodles and broth. Carefully place a fried egg on top of each patty. Place about a cup of slaw to the side of each patty. Sprinkle with black sesame seeds, green onions, and cilantro. Serve at once. Who doesn't enjoy a delicious homemade burger? I ran across a recipe for Butter Burgers on Pinterest shortly after I received my Cluck 'n Moo Beef and Chicken Ground Meat. Light bulbs went off on how I could adapt the recipe to be something my family would love. There are really so many directions you could go in to make this your family's favorite. I encourage you to be creative and put your own spin on it. The one thing I absolutely recommend that you use is the Cluck 'n Moo! It really has a great flavor and texture. 1) In a food processor, combine butter, chives, garlic and tarragon. Pulse until you have a smooth paste. Set aside. 2) In a large bowl combine Cluck 'n Moo, pepper, salt and grated onion. Using your hands, work it all into the meat. 3) Press the Cluck 'n Moo into an 8" x "12 inch buttered casserole dish. Make sure the meat is evenly distributed. 4) Using a spoon, spread the herb butter completely across the top of the meat. (I had to place dots of butter down first, then smooth it out across the meat). 5) Cover the casserole dish with foil and place in a preheated 375°F oven. Bake for 45 minutes. Check the temperature to make sure meat has reached at least 165°F and that the juices run clear. 8) Place the bread rounds on a cookie sheet, then place under broiler on high. Remove from broiler when the bread is browned. 9) Build your burger how you like it. I served plain with a tomato and sweet/spicy pickle chip garnish. *After I cut my burger rounds, I just put the leftover meat in a baggie for my husband to have a sandwich later. He didn't mind having the odd bits and pieces. This is an adaptation of the delicious Vietnamese Banh Mi sandwich, served with pickled carrots and daikon radish, cucumber slices, cilantro, mayonnaise and one or more of a variety of different meats. “Banh Mi” actually refers to bread and these sandwiches are generally served on a crispy-crusted hoagie-roll type bread with a soft and light interior. The closest I could come to that was a baguette sliced into pieces and then in half. The pickled relish can be made a day (or two or three) before making the burgers. Mix Cluck 'n Moo Ground, chili-garlic sauce, fish sauce, soy sauce and chopped white scallion portions in a medium bowl until well-combined. Form mixture into 4 patties. Grill over medium high heat until internal temperature reaches 165°F. Serve on baguette with mayonnaise and cilantro. 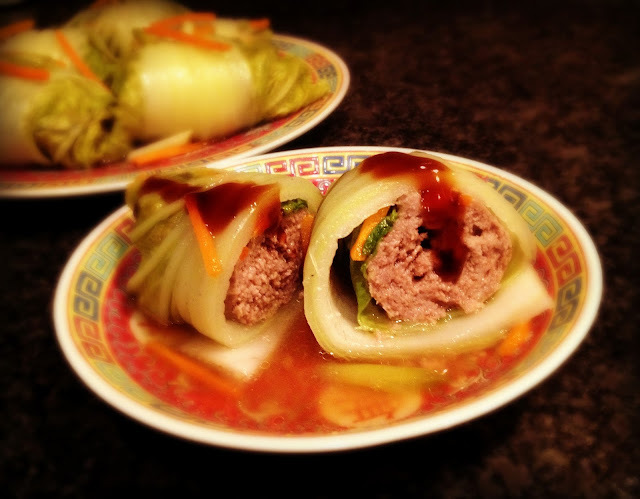 The unique combination of lean, grass-fed beef and ground chicken provides the perfect filling for these tasty Asian-inspired cabbage rolls. Flavored with fresh ginger and garlic, these rolls are accented by the subtle sweetness from the cabbage and hints of oyster sauce and sesame oil. Fresh carrots add texture and color, while shiitake mushrooms add a punch of umami. Steamed to tender goodness, these meaty rolls retain their juicy goodness through and through. For the filling: Mix all ingredients well. Cover and refrigerate for two hours or overnight. For the rolls: Soak mushrooms in warm water for one hour, or until very soft. Gently squeeze excess water from mushrooms. Thinly slice mushrooms, and place in a small bowl. Drizzle with peanut oil, soy sauce, sesame oil, sugar and cornstarch. Stir to coat well, cover and refrigerate for two hours or overnight. Prepare ice bath by filling a large bowl with ice water. Place a half-inch of salted water in a wide, shallow lidded pot. Bring to a simmer over medium-high heat. Add cabbage leaves, reduce heat, and gently simmer until thick portion of leaves is just pliable, but still firm. Remove from heat and plunge immediately into ice bath. Drain and pat dry. Set leaves aside. Arrange assembly line by lining up leaves, meat mixture, carrots, and marinated mushrooms. To assemble: Place a rounded 1/2 cup of the meat mixture in the stalk end of a cabbage leaf. Arrange carrots and a few mushroom slices atop meat. Roll up, tucking in leafy sides. Arrange seam-side down in a shallow, heat-proof dish. Repeat until all leaves are filled and wrapped. Reserve some of the carrots for garnish. Combine sauce ingredients in a small saucepan, whisking in cornstarch to blend. Bring to a simmer, then pour all over cabbage rolls. Sprinkle with green onions and reserved carrots. 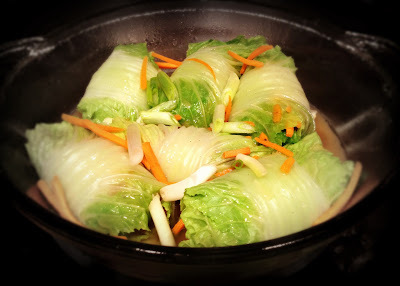 To serve, carefully remove cabbage rolls from dish. Spoon some of the sauce on and around rolls, and drizzle with oyster sauce if desired. It’s graduation season and that means so many parties! It seems each year the parties extend well into the summer. When we add in the holidays, the party season never ends! I always try to bring a unique appetizer to every event. This year, my favorite appetizer is Spicy Stuffed Mushrooms. I wasn’t sure what I would be bringing to parties until I received the generous shipment of Cluck ‘n Moo Ground! It’s flavorful and also lean, with the combination of ground beef and chicken. 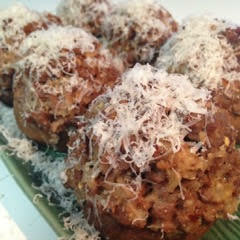 These Spicy Stuffed Mushrooms were met with rave reviews and will be a regular at many parties to come! In a large skillet, heat the oil over medium heat. Add the Cluck ‘n Moo Ground and cook until the meat is completely browned, breaking it up with a wooden spoon as it cooks. Remove the meat to a large bowl with a slotted spoon, leaving the pan juices in the skillet. Allow the meat to cool to room temperature. Add the onion to the pan juices and cook until the onion is caramelized, stirring frequently, about 10-15 minutes. Add the garlic and cook until fragrant, about 30-45 seconds. Add the mushroom stem pieces and continue to cook until the mushroom pieces have browned. Remove the skillet from the heat, allow to cool slightly, and add the onion/garlic/mushroom mix to the bowl with the meat. Add the egg, panko, Parmesan Reggiano, half and half, and crushed red pepper flakes. Mix well and check for seasoning. It should have a nice spicy taste. Season with salt and pepper to taste. 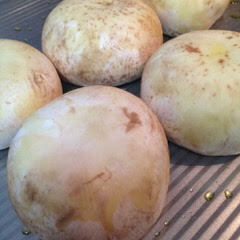 Rub the mushroom caps with olive oil to thoroughly coat and place on a rimmed baking sheet. 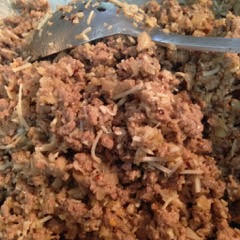 Using an ice cream scoop, distribute the stuffing mixture equally between the 12 caps. Gently press the mixture into the caps. 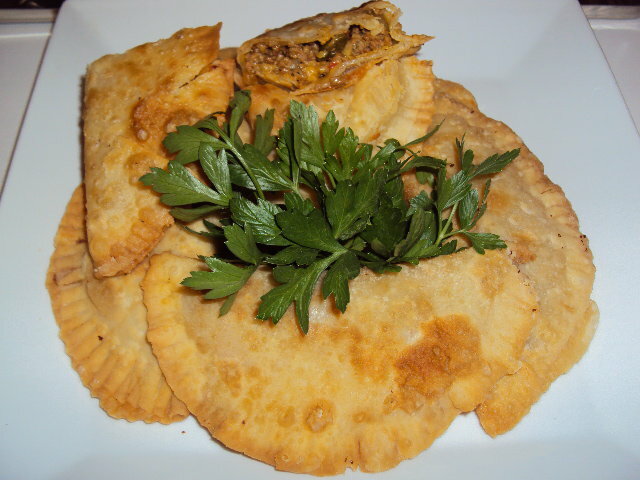 Bake at 350°F for approximately 25-30 minutes, until the mushrooms are cooked through and the stuffing has turned golden brown. Top the stuffed mushrooms with additional grated cheese and serve immediately. 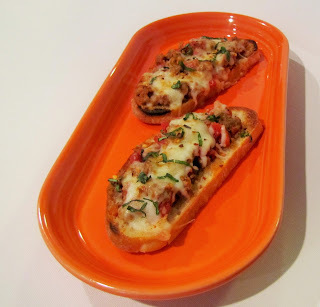 This is one appetizer that will have your family and friends looking for more! **Note: There are many opinions about the proper way to clean mushrooms. If Jacques Pepin says it is okay to wash the mushrooms with cold water just as you are preparing to cook them, then that is fine with me! We are always looking for healthy choices to reduce the fat and calories in our meals. When it comes time for choosing a ground beef alternative, what is your go-to? Ground turkey? Ground chicken? Ground buffalo? Ground Cluck 'n Moo? Wait, what? Cluck 'n Moo? Why yes, Cluck 'n Moo! A new healthy alternative to ground beef. The fine folks at Cluck 'n Moo share this about their product: "Enjoy a perfect-crafted mix of gluten-free and antibiotic and hormone free, humanely raised chicken and grass-fed beef. Cluck ‘n Moo Ground™ delivers the same juicy taste and texture as regular ground beef, but with 52% less fat, 34% fewer calories, and 57% less saturated fat. Substitute Cluck ‘n Moo Ground™ in all of your recipes calling for ground beef." So, since my husband and I are always looking for healthy choices to reduce the fat and calories in our meals, I was excited to learn that 37 Cooks would be receiving Cluck 'n Moo Ground to create exciting new dishes with. There are times when my husband and I want a light dinner. 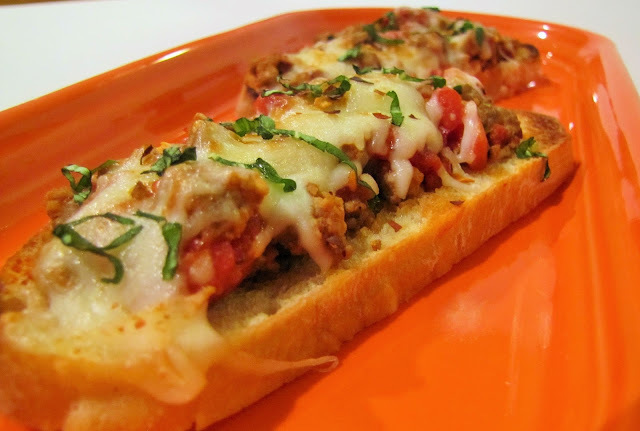 These delicious Cluck 'n Moo Pizzaiola on Ciabatta fit that bill. I hope you enjoy them, too, and I hope you will give Cluck 'n Moo a try. My husband and I definitely enjoyed their product and gave them a big thumbs up! 1. Heat two teaspoons of olive oil in large skillet, medium heat. 2. Add Cluck 'n Moo Ground to skillet and brown thoroughly. Drain and return to skillet. 3. Add salt, pepper, garlic, oregano and tomatoes to skillet, stir to combine. 4. Using two forks, gently tear tomatoes apart. 5. Reduce heat to low and simmer for 20 minutes, or until sauce has thickened. 6. Lightly brush Ciabatta bread slices with remaining olive oil. 7. Place on a baking sheet and put under a broiler (high heat) for 1 - 2 minutes until lightly browned. 9. Mix cheese together in small bowl, then top each slice with a generous amount. 10. Place back under broiler 2 - 3 minutes, until cheese is bubbling and lightly browned. 11. Garnish with basil ribbons and crushed red pepper. Serve immediately. *This makes enough to freeze a portion for another meal. Divide the Cluck 'n Moo Ground into 6 even parts. Wet your hands and with each part, roll the meat into a ball, flatten and put a slight dent in the middle with your thumb. I like to do this on parchment paper. Wash your hands and grab your pepper grinder! In a small bowl, grind the pepper until you have about 2 Tablespoons. Sprinkle 1 Tablespoon over all 6 patties and do a quick grind of salt over the patties, as well. Flip the burgers over and repeat. For the bacon, preheat your oven to 400°F. Place the bacon on a rack on a sheet pan. Pepper the bacon with your pepper grinder until desired. I like extra pepper! Bake 15 minutes, check and bake a few minutes longer until desired crispiness. Grab a toasted roll and slather on both the top and bottom a good helping of homemade ranch (recipe below.) Top the bottom bun with your burger patty, a piece of peppered bacon, tomato, onion and lettuce. Top with the top bun and enjoy! In a medium mixing bowl, use a whisk to wish together the buttermilk, sour cream and mayonnaise. When it comes together, whisk in the fresh herbs, minced garlic, lemon juice and salt and pepper. I recommend letting this sit at least 45 minutes before dressing your burgers. For the filling, heat olive oil in a shallow pan. Add onion, pepper, garlic and saute for 3 minutes. Add Cluck n' Moo Ground and brown until cooked. Add tomato paste, adobo, alcaparrado and cilantro. Saute for a few more minutes. Remove from stove and set aside. On a lightly floured work surface, roll out discos with a rolling pin until about 1/2 larger in diameter. Place a Tablespoon of filling in the rolled out disco. With a wet finger, moisten around the outer edges of the circle, fold over and then press down along the edges with a fork to seal. Repeat with the remaining nine discos. Deep fry in corn oil, until evenly browned on both sides. Sometimes I want the taste of a burger, but don't want the heaviness of 80/20 ground beef. The folks over at Cluck 'n Moo have created a very tasty product that is a blend of chicken and grass-fed beef, ground into a product with a whopping 52% less fat and 34% fewer calories than traditional grain-fed beef burgers. Give this product a try, you will not know that you are eating a beef and chicken mix and will certainly not be disappointed in the flavor of the blend. After trying it myself, I am hooked on Cluck 'n Moo! Preheat grill to medium-high heat. Add basil, Parmesan cheese, garlic and ground pepper to the Cluck 'n Moo mix. Mix well to evenly distribute the spices and cheese. Clean out the gills from the portabella mushrooms. Add a drizzle of olive oil to the outside of the mushroom caps and rub to cover the mushrooms. Flip over and stuff the meat mix in the mushrooms, patting down to form a patty inside. Grill for approximately 15 minutes, or until you reach an internal temperature of 165°F. Add a slice of tomato and drizzle with Balsamic vinegar. Cover with two slices of mozzarella cheese. Grill for an additional 5 minutes to melt the cheese. Top with pesto and serve with a fresh side salad.